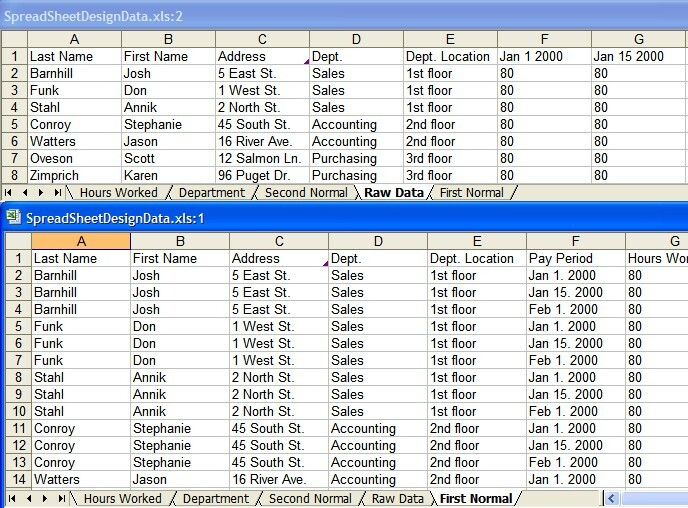 When setting up a database, you may find that there is a table structure in another database that would be appropriate. You could Import the table, but then you have to clear out the useless records. Select the database that contains the tables you want to copy and click the Import button. Select the appropriate table in the Database window. In Access 2000 and above, choose File>Export. When a database contains linked tables, you may need to find the location of the source file. Clicking Yes when Access informs you that some properties can not be modified. 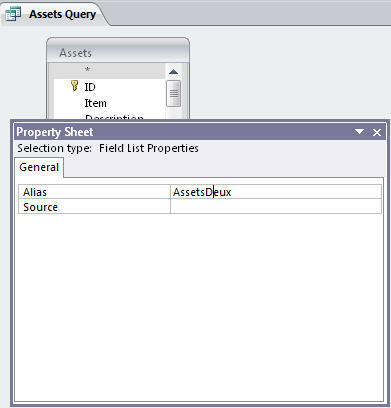 The location will appear in the Description text box in the Table Properties dialog box. If you do not want the ordinary user to see a table in your database, you can hide it in the database windows so that other users cannot select it. Preface the table's name with the four letters 'Usys'. For example, if your table's name is ProprietaryCosts , change it to Usys ProprietaryCosts. This makes your table into a system object which Access does not display. To see this table later, in Tools>Options, on the View tab in the Show section, put a check mark by System objects. If we agree among ourselves not to tell the uninitiated, no one need be the wiser. Embedding information in a Primary key or ID, can lead to trouble in the future. Autonumbering can give a false sense of order. There is an initial tendency to try to keep all database records in some order. This violates the sense of a relational database. The records can be sorted or filtered as needed. Still some record numbering scheme may be desired. "In relational database theory, the records in a table cannot have any physical order, so record numbers represent faulty thinking. In place of record numbers, Access uses the Primary Key of the table, or the Bookmark of a recordset. If you are accustomed from another database and find it difficult to conceive of life without record numbers, check out What, no record numbers?" Automatically set up links to data outside of Access. It still works in Access/Outlook '07. Choose File >Open from the menu bar. Under Files Of Type choose Outlook(). Locate your Outlook PST files. Choose Contacts, or if you have set up separate files for different groups choose an appropriate one. The wizard walks you through the process of creating an Access database with a linked Contact table. The changes made in Access will be reflected in Outlook and vice versa. If you want to create a new database that will link to other data that isn't in an Access format, you can do it quickly. The classic way is to use the File>Get External Data >Link Tables method. However you can simply choose File >Open from the menu bar. (such as Microsoft Excel (*.xls)). Open the file and Access will automatically create an MDB file with the same name as the data source you selected and will set up links to the data. From there you can develop forms, queries and reports. While working with a query in Design view, you may find that you need to add a table or query. The "book" way to do it is to click the Show Table toolbar button, drag the appropriate objects from the list, and then close the dialog box. Drag the table or query object's icon from the Database window/Navigation pane directly to the top half of the query design grid. When you need to change the table name referenced in an existing Access query, it can be a pain. This is especially true if the query contains a large number of fields. You typically might use an alias when you need to relate a table to itself or tables have long or unwieldy names. If you make a practice of always using aliases in your queries, you can easily change which table is used by changing the one occurrence of the original table name in the query's FROM clause. Right-click on the table field list and choose Properties. Then, enter the alias name you want to use in the Alias text box. There should not be any "intelligence" in an AutoNumber field. It is meant as an index field and not anything else. If the need should arise to reset the field, if your table does NOT contain any records, simply compacting the database again will set the Autonumber field back to 1. Another way would be to delete the AutoNumber field and re-insert it in the table. Here's a long way to start at a specific number. Create your table with an AutoNumber type field, but don't enter any records. Create another table with only a single Long Integer Number type field. This field must have same name as the AutoNumber field in the first table. Enter one record in the second table that is a number one less than the required start of the AutoNumber for the first table. Now create an append query to append the record in the second table to the first table and run the query. You can now delete the second table and begin entering your data into the first table. "This is some sample code that shows how to programmatically reset all AutoNumber fields in an Access Database to a correct value (whether it be 0 or the max value + 1). In addition, it contains code for Compacting and Repairing an MS Access Database. This is perfect for people who are working with a complicated Access Database and have experienced AutoNumber bugs! What happens to a list when one record is deleted? If you need to correct the numbering, see these instructions.